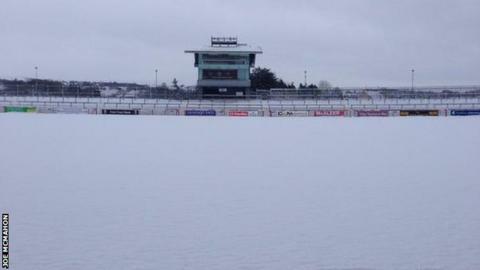 Four of Wednesday night's McKenna Cup games have been postponed because of unplayable pitches. The Section C encounter between Tyrone and Antrim and the Cavan v Monaghan clash in Section A were called off as the pitches were covered with snow. Both Section B games also fell victim to the extreme weather - Derry's match against Queen's and the meeting of Donegal and Fermanagh at Ballybofey. Down's game with Ulster University and Armagh v St Mary's will both go ahead. Newry's Pairc Esler is the venue for Down's Section A meeting with Ulster University with Armagh's Section C tussle with St Mary's taking place at the Athletic Grounds. The postponed games have been rearranged for Sunday, 18 January which was the planned date for the semi-finals. Both semi-finals will now take place on Wednesday, 21 January with the competition's decider three days later on 24 January. The postponements mean that the semi-finals picture cannot be definitively decided by Wednesday's remaining action. Down, Ulster University, Cavan and Monaghan all have a win and a defeat from their opening two Section A games. In Section C, Armagh's opening defeat by group leaders Tyrone was followed by a comfortable victory over Antrim while St Mary's are out of contention for a semi-final place after their defeats by the Saffrons and Red Hands. Tyrone are the holders of the competition which involves the nine Ulster counties plus three college teams - Queen's, Ulster University and St Mary's.